Columbia Paint can help with your next interior painting project! Are you going to try your hand at interior painting? 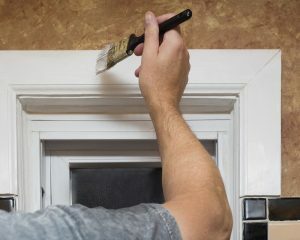 If you are a novice, there are a few things you should know about painting before you get started. The following are a few common interior painting mistakes you will want to avoid if you’re going to achieve the best results possible. Painting is a process. It takes a lot of planning and preparation. In addition to moving furniture and laying down drop cloths, you also want to use painters tape. It is one of the best tools when it comes to protecting your baseboards, trim, and windows. It is also handy when you want to create patterns on walls or want straight lines. Also, it is important to realize that masking tape is not the same thing as painters tape. If you use masking tape, don’t be surprised if the paint bleeds through and you are left with terrible results. Many homeowners are under the misconception that rotten wood can be salvaged if you paint over it. This is certainly not the case. Old wood needs to be replaced before you start your painting project. Painting the Ceiling At The Wrong Time. If you are painting a room in its entirety, the general rule of thumb should always be to paint the ceiling first. Most people make the mistake of waiting until after they paint the walls to paint the ceiling. The reason you do not want to do this is because drips from the ceiling can ruin your paint job. It is also important that you let the ceiling dry before starting on the walls. Although you can usually remove dried paint from fixtures like door knobs, door hinges, and lighting fixtures, you are much better off protecting them before you start your painting project. You can either remove them entirely or cover them up. If you are going to use a paintbrush for baseboards, trim, etc., you should not always have the mentality that less is more when you go to dip your brush into the paint. In order to achieve optimum results, you should only really be dipping the tip of your brush into your paint.